Michael L. Solomon, a partner in the law firm of Solomon, Steiner & Peck, Ltd., has been practicing law for over 35 years. His field of expertise includes estate planning, corporate and business law, tax law, and employee benefits. He received his law degree from Georgetown University Law Center in 1976, and his Masters in Tax Law in 1980. Prior to entering private practice, he was an attorney with the National Office of the IRS for over two years. Mr. Solomon is a member of the Ohio and American Bar Associations. He is a frequent speaker both locally and nationally on tax and business related topics, including presentations before the Cleveland Tax Institute, and the Ohio Society of Certified Public Accountants State and Federal Tax Forum. 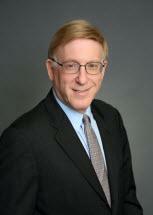 Mr. Solomon has co-chaired American Bar Association National Institutes on Pension Issues. Additionally, Mr. Solomon has been the President of the Ohio Venture Association and was a member of the Board of Directors of the Cleveland Area Development Finance Corporation.